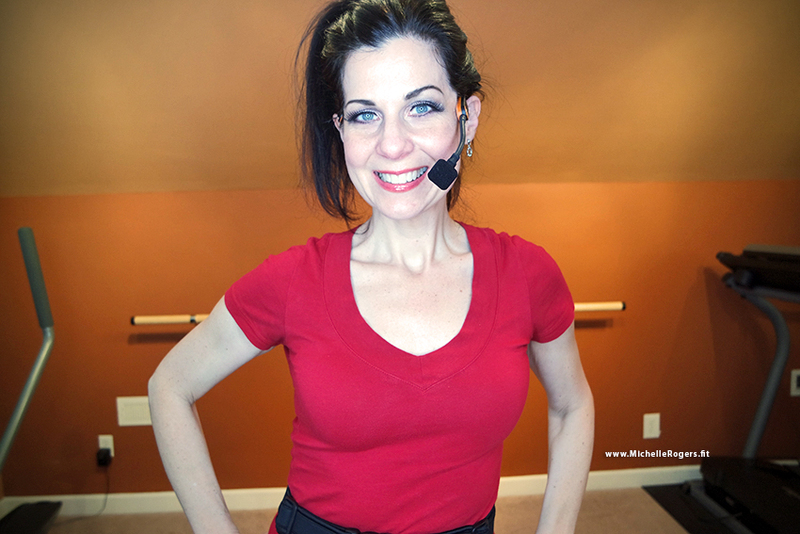 Wearing the Shure Fitness Headset and Sound Professionals carrier belt. Full review below. Note: This review was updated on Aug. 30, 2018 with links to a newer model of speaker and a portable power bank for the wireless headset receiver. 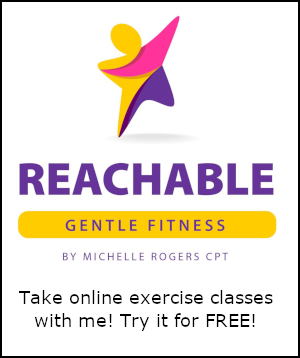 I am a fitness instructor, currently teaching a large group exercise class at a gym and also creating my own classes and pop-up workshops in various locations. When it comes to my classes and in my own workouts, I’m ALL about the music! 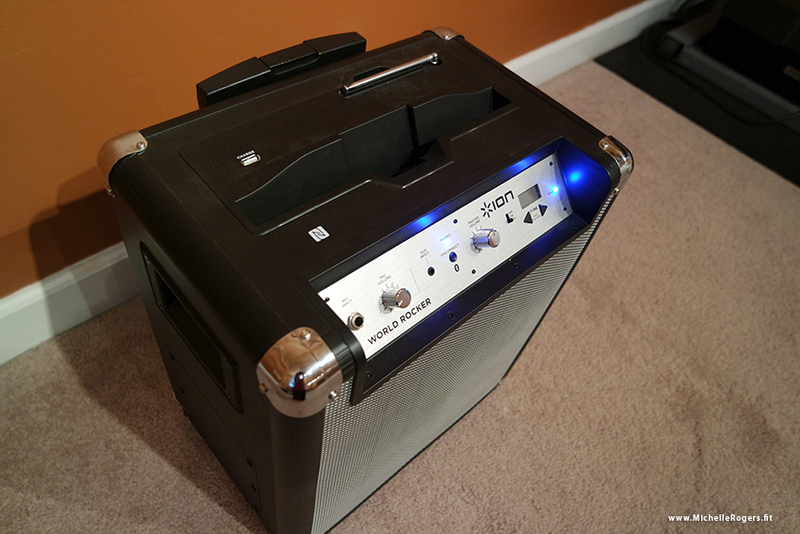 It needs to sound GREAT, be loud enough to fill the space, and be portable. And I also knew I wanted to use a quality headset mic. So, I put a lot of thought into what audio equipment I would need and what would be worth the investment. This review is not sponsored by the manufacturers of these products. I purchased these items myself from Amazon, after extensive research. Amazon affiliate links are included for each item. All of these products were very highly rated with 4-5 star customer reviews. The time I took to do that research was well spent. I have been using this equipment for several months now and am still thrilled with all of it! Here’s my complete setup, and some helpful tips when using these items. 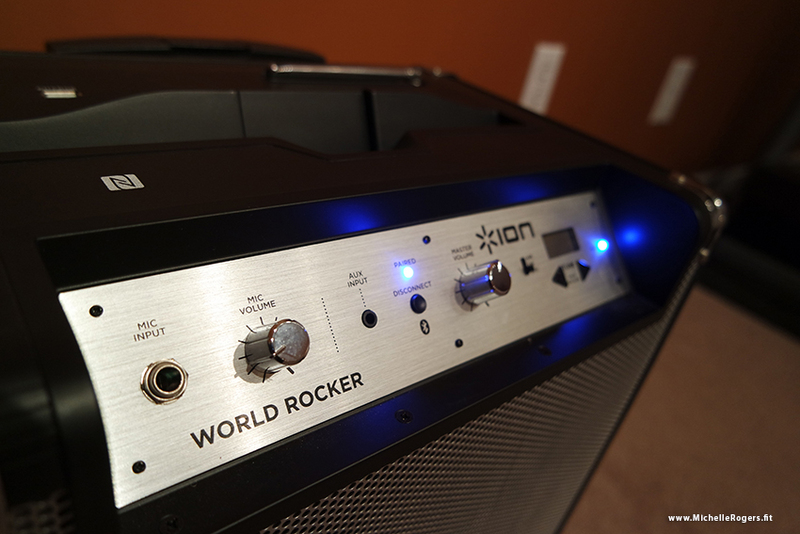 The Ion World Rocker Wireless Speaker can be used plugged in, or with the internal rechargeable battery. I am so in love with this speaker, I hardly know where to start. First of all, and most importantly, it sounds incredible! It gets loud. And it is a single unit for using both your music and mic simultaneously. It has two separate volume controls for the mic and the music. It’s bluetooth wireless, and connects to my iPhone automatically. It has an internal rechargeable battery, so it can be used anywhere. It’s rugged and yet completely portable. I was recently at a gym that used Ion speakers like this as the sole audio for their group fitness rooms. And it’s certainly not just for fitness class uses. It would be great for Karaoke, speaking engagements, churches, presentations, parties, music performances, or any other kind of small to medium sized event. This speaker even comes with a wired hand-held mic! 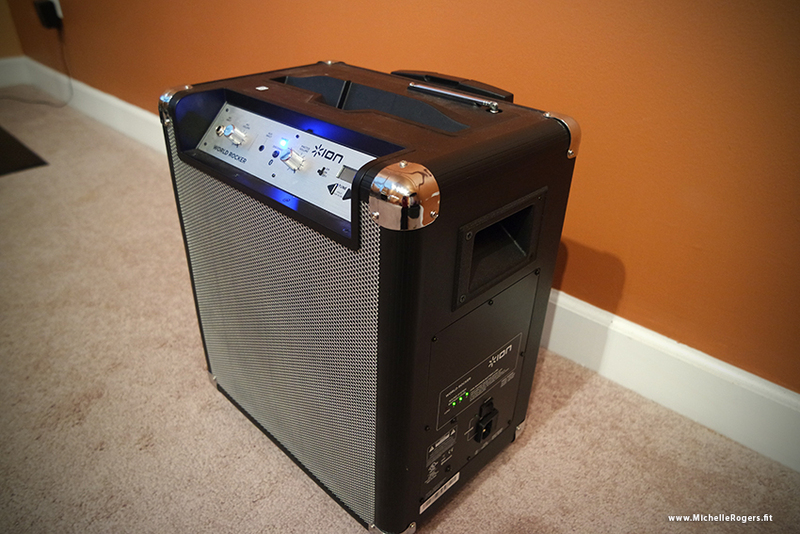 Even if you’re not on the go, you’ll love having this speaker in your home or workplace. 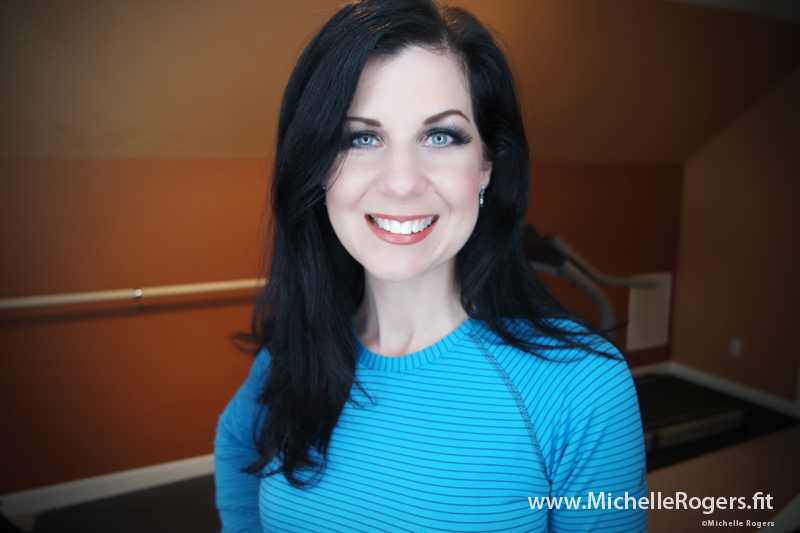 When I’m not using it for a class, I keep it in my home fitness studio where it’s used daily during workouts, with clients, and for practicing choreography for my classes. Sometimes I bring it downstairs when I’m cleaning or cooking and want music to fill the house. I like to listen to music pretty much constantly, so I’ve even used the Ion in my office while I’m working at the computer. 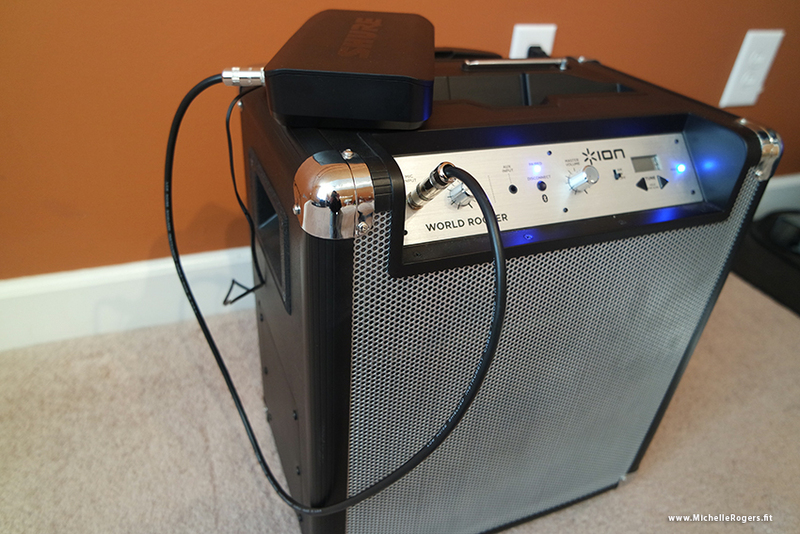 I highly recommend the Ion World Rocker speaker. I use it on a daily basis and have for over a year. Five stars — it rocks!! There are separate volume controls for the mic and for the music. A USB charge input is conveniently located on the top for your phone or tablet, and there’s a built-in space on top to hold your device. There is also an audio input on the front by the volume dial, if you want to connect your device by wire instead of bluetooth. The antenna is for the built-in AM/FM radio. The speaker has a sturdy telescoping handle and rear wheels for easy transport. 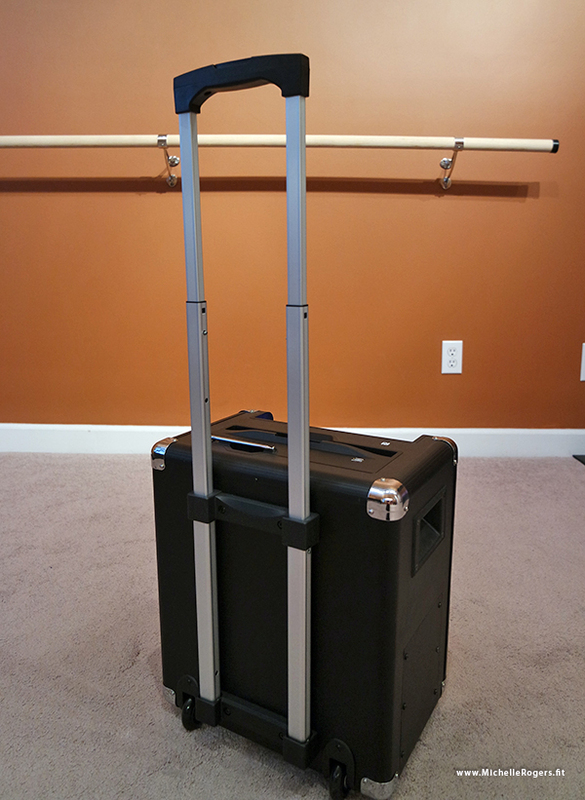 There are also built-in handles on each side for carrying. This speaker has powerful sound yet is completely portable! I’m always amazed at the fitness instructors who don’t use a mic. If shouting for an hour works well for you, great. It doesn’t for me. I naturally have a soft voice. Plus, when I’m teaching cardio dance I want the music loud enough so we can all hear the beat. I’m not a shouter and I want everyone in a large class to hear instructions clearly. I want to appear as professional as I can. I need to use a mic. 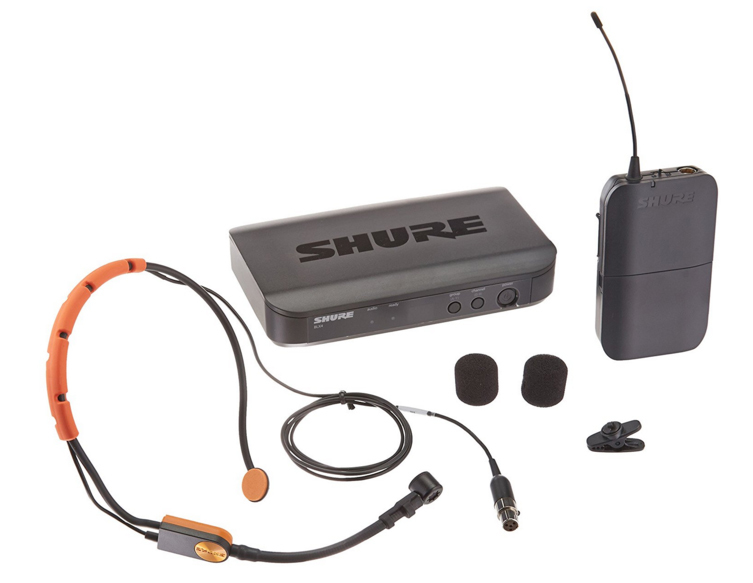 While it was an investment, I’m so glad I found my Shure wireless mic set. Let’s be honest here — you get what you pay for. It’s specifically made for fitness instructors and physical movement. The sound quality is crystal clear. And, it works great with my Ion speaker. I also take the headset, transmitter, belt and receiver with me to the gym I’m teaching at and use with their large speaker. The transmitter takes two AA batteries and I have experienced very decent battery life with it. It’s always a good idea to bring extra batteries with you though, just in case. The headset is comfortable and stays in place, and the part with the mic is bendable so you can put it in just the right position. 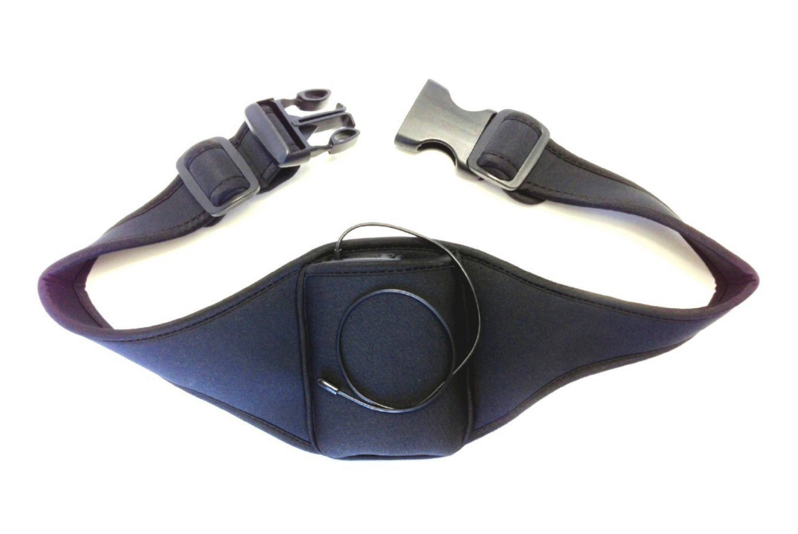 I use it with a belt (details to follow) that is also comfortable and stays in place, and is working out great for me. To connect the headset system to the speaker, you’ll need a 1/4″ male-to-male audio cable which is not included in the above set. You can get one from Amazon or any music store that sells electric guitars. They come in many lengths, but you only need enough to connect the receiver to the speaker. A 3′ cable is a good length if placing the receiver on top of the speaker. One other thing to note about using this headset set with a speaker — as with any system you will get shrill feedback if you get too close to it while wearing the headset. I’ve only experienced this while being within 3-4′ or so of the receiver, so it’s not much of a problem. I just don’t hang out directly by the speaker when on mic. There is adjustable gain control though, if needed. Please be aware that although the speaker has an internal battery, this receiver does not and it needs to be plugged in to an electrical outlet. For that, I use a portable rechargeable AC power bank (pictured below) so I can use my receiver anywhere. I’m SO glad I found this! 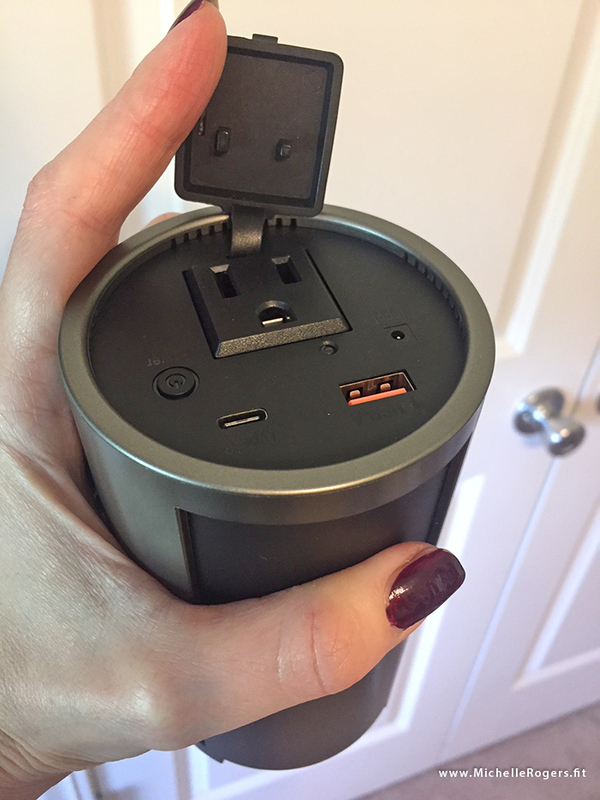 It’s small and lightweight (about the size of a travel coffee mug) and perfect for my needs. You can plug in anything with this portable rechargeable AC power bank! For teaching fitness, I highly recommend getting a carrier belt for wearing your transmitter, rather than relying on the built-in clip. I use this belt made by Sound Professionals and am very happy with it. It’s perfect for active physical movement, is comfortable and stays put, and made of sweat-absorbent neoprene. A height-adjustable, portable music stand has been a life-saver for me. 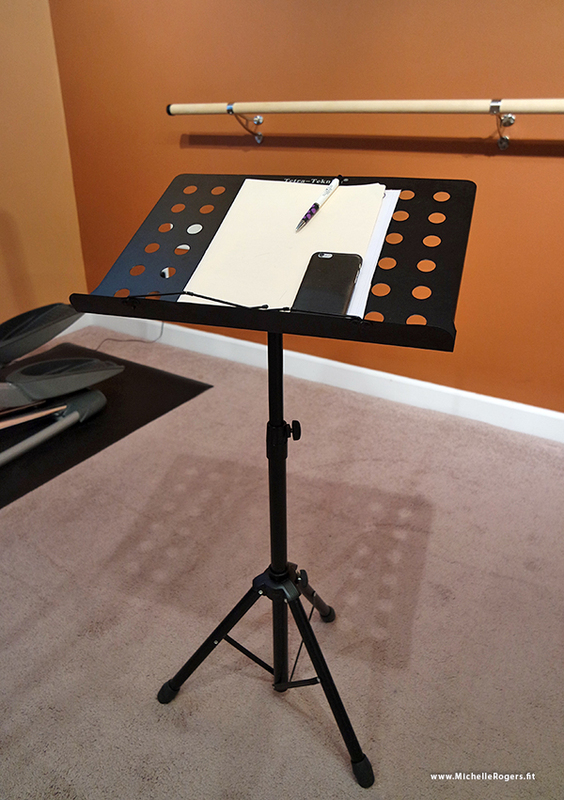 And finally, although this isn’t a piece of audio equipment, it is one of the handiest things I’ve bought for my fitness class endeavors — an adjustable music stand. I take notes as I’m creating choreography, and I need to look at those notes as I’m learning and practicing. Before I got this stand, I would try to prop up my notes on something or put them on a chair or table. No matter what I tried they wouldn’t stay put, or it would be too low or too far away to see. It was disruptive when I had to stop and try to write on them. So I got the idea to use a sturdy but fully portable height-adjustable music stand. This took my programming to a whole new level. Suddenly I was able to create and learn much more quickly and efficiently. It also helped calm my worries about being able to memorize my program. I can easily fold up and take this stand to class if needed. Sooo many problems solved with this simple piece of equipment! There are even little holders on the front that keep papers from being blown off by the fan. Be sure you get one that is height-adjustable for standing like this one. Some stands are made for using only at seat level. I hope you find these tips and equipment suggestions helpful in your own work. Please pass this review along to any colleagues or facilities it might help as well! Great info here! My yoga instructors have been struggling with the system in our studio lately. They could use this post. PS you were asking me for yoga info for seniors–there’s a GREAt blog that I subscribe to called Yoga for Healthy Aging: yogaforhealthyaging.blogspot.com. Baxter Bell MD is an expert in this field. Great, thank you so much, Wendy! 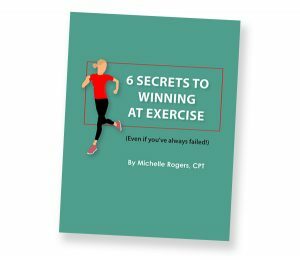 Lots of great information in the post – thanks! I used to be a spinning instructor and it would drive me crazy when their audio equipment didnt work. 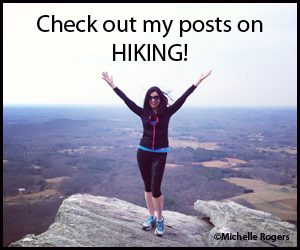 If I ever go back to teaching, I’ll definitely refer back to this post! I can’t tell you how many times my spin instructor stops to mess with the sound system every. Single. Week. So frustrating. Good to know this product is out there! This is awesome! It’s always the worst when you can’t hear the instructor. I never thought about fitness instructors needing items like this. It seems like you found some really awesome products that are working well for you! As a former group ex instructor, I agree that having the right music system in place is key to a great class. Love your photos! Great info! MY BF is a Pure Barre instructor I will have to ask her what she uses. Music is often the best part of class and if that gets bad and I can’t understand the teacher then I am not having fun! This is a great review. I don’t teach group fitness classes but I do group running so I’m wondering if I could incorporate this somehow. What a wonderful review! You look like you are channeling your inner Brittany. I’m sure you make your classes fun! I agree, music is life! Very clever using the music stand! Lots of great info here! I’m sure it is really frustrating as an instructor to not have equipment that works well. I don’t take group classes, but I can’t imagine enjoying one without good music. Hope these products work great for you. Having the speaker be as portable as it is sounds great, and I’m sure is a huge backsaver. What a great set up! I am not sure I could ever do what you do! I would probably ramble on and on if someone gave me a headset LOL. Looks like a great piece of equipment. I will def pass this post on to my fitness instructor friends!